NEW YORK — With coffee cup in hand, actually it’s sitting on the desk in front of me, there was something manager Don Wakamatsu mentioned last night that piqued my curiosity, and even at 93 years of age (in sportswriter years) my curiosity can still be piqued. He mentioned that for one of the few times this season, Ichiro and Russell Branyan were held hitless in the same game. Ichiro went 0-for-4 last night and never got the ball out of the infield, although he doesn’t have to get the ball out of the infield to get a hit, something that has happened 36 times this season. Branyan went 0-for-4, and wore, as players call it, “A golden sombrero” which, in layman’s terms, means four strikeouts in one game. It was, in fact, just the second time the Mariners’ one-two hitters went hitless in the same game this season, but the first time neither of them reached base. Ichiro was 0-for-4 against the Tigers on April 18 and 0-for-4 against the Rays on April 21. Branyan did not play in either game. Ichiro was 0-for-4 against the White Sox in Chicago on April 28 and Branyan went 0-for-3, but the first baseman reached base on a walk. Same scenario on June 16 at San Diego. Ichiro went 0-for-4 and Branyan went 0-for-3 with a walk. So having both of them go hitless in the same game and not make it to first base was a rarity, indeed. For the second time this season, Branyan appears to be a little tired and it wouldn’t surprise me to see him get tonight off against Yankees lefty CC Sabathia. Mike Sweeney could be at first base for the series finale. This is the second time in the past two road trips that the Mariners have faced a hotter-than-blue-blazes team and have been unable to win. The Rockies were on a roll when the Mariners visited Denver last month and were swept in a three-game Interleague series. The Yankees had a five-game winning streak entering this three-game series and have won the first two games. Maybe the weather can cool off the Bronx Bombers. 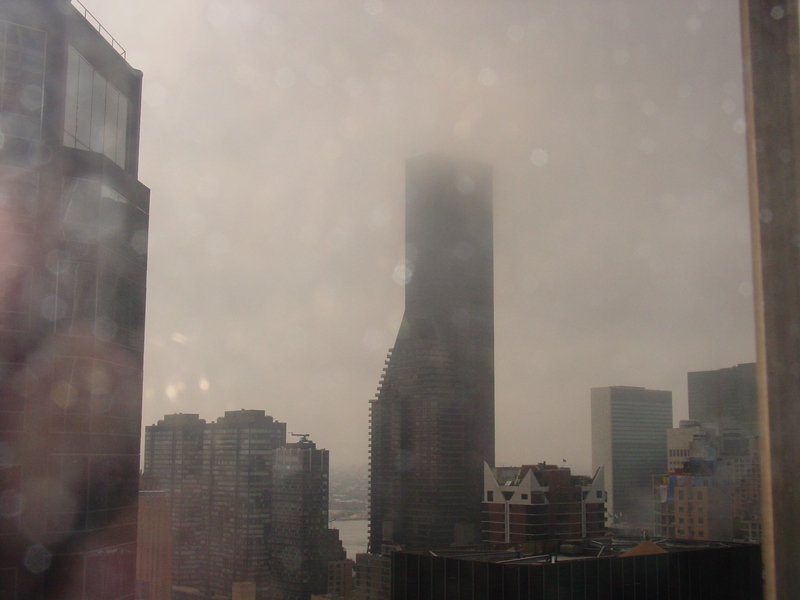 Looking outside my hotel room window on the 27th floor of the not-exactly luxurious Courtyard by Marriott hotel on 3rd Avenue and 53rd Street (see above photo), clouds are rolling in and there is a good chance of rain this afternoon and evening. But because this is the Mariners’ one-and-only trip to New York this season, I have a hunch that we could wait all night to play the series finale. I was wondering last night when was the last time Ken Griffey Jr. and Alex Rodriguez hit home runs on the same day in the same ballpark. I was going to do some heavy-duty research, but I’ m a busy man and really don’t have the time. So, if you happen to know the answer, send me an email at jim.street@mlb.com and I will make sure to give you part of the credit for knowing the answer. A note just came out that the last time Griffey and Rodriguez hit home runs in the same game actually was Sept. 21, 1999. That info was provided by the Elias Sports Bureau. Meanwhile, Tim Hevly (the team’s rock-solid P.R. dude in an office filled with solid P.R. dudes and a new mom on maternity leave in Puyallup) and I were talking last night about what the Mariners’ past few seasons would have been like without free agency. Can’t you just imagine having Junior and A-Rod being teammates from 1995 until now, with Randy Johnson in the rotation? Seattle could have been the MLB capital of the world for, oh, like almost 15 years or so. Well, the coffee cup is empty, and you know what that means for someone from Seattle. Refill, please, with room. It is now later in the day — much later — and the series finale has been delayed by rain. Well, delayed by the threat of rain. It is not raining and the tarp is not on the field, but this is New York, which explains a lot. The last thing the Yanks want to do is have lefty CC Sabathia throw several pitches and then have to sit through a lengthy rain delay. But if it doesn’t start raining here pretty quickly, a lot of fans are going to get a little miffed. One of the fans is Jack Nicholson, who is stitting directly behind home plate in one of those expensive seats. An update: The game will start at 4:40 p.m. PT.